Every other year my church hosts a women's Candlelight Dessert. The event is offered Thursday and Friday. It is an outreach event to our community. I volunteered to chair the event this year. Over 500 women attended this past week. The planning meetings begin in September. In October we begin sign-ups for hostesses. The ladies at church have an opportunity to hostess a table and can have a co-hostess. Guest sign-ups begin in November. Each hostess decorates a table and prepares a dessert for eight women. The men in our church serve coffee, water and hot water for tea. Our program begins with our bell choir and a punch bowl reception in the lobby of the church. The doors to the Fellowship Center are opened a half hour later and women view the tables for another half hour. This year we had a wonderful young man play the cello while the women were viewing the tables. The room is dark except for the candlelight and the soft white lights throughout the room. After another half hour, the women are seated and after brief introductions, the desserts are served. Then our program begins and we have special music provided this year by a young women who is a dear friend of my daughter and then a presentation of the gospel message is heard. Our speaker this year is a dynamic woman, who spoke of "A Journey to Surrender". I love how the napkin looks like whipped cream in the teacup! We conclude with more music and prayer and an opportunity to fill out a card in response to all that the ladies have heard and experienced throughout the evening. Thirty-five ladies responded to God's offer of forgiveness and salvation. Many prayers were answered these two evenings. It was such a privilege to be a part of the dessert. I was blessed with an amazing group of women who devoted themselves to fulfilling all of the details required to put on such a large event. I now know what the mother-of-the-bride must feel when the wedding she's been planning for months is over. I know that I would do it all again just to witness those thirty-five ladies make the best decision of their lifetime! What a precious moment for those dear ladies who made such a wonderful decision. What a beautiful way to bless your community and serve the Lord!! What a wonderful event! 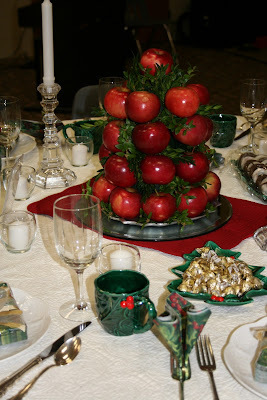 I have hosted in a breakfast done like this, but I love the idea of the Christmas dessert. Each table you shared is gorgeous! Even better is the blessing this event was to the women who responded. What a wonderful event!! that is amazing that 35 of them recieved Christ. I loved the pictures!! Great post Renee! Wow! I'm speechless at the beauty of the tables and the beauty of the responses. What a special Christmas this will be for those 35ladies. Thank you for doing this. And for sharing it here. What a wonderful idea; I'm so glad it went well and what a fabulous response to God's love! And yes, after the wedding is a flat feeling but for me (after one and only child's) was the grief I felt that life would never be the same again! Very pretty settings and how Wonderful that so many ladies accepted Jesus! Sucessful I'd say . . .
Uau Renee ,Good morning I found your beautiful blog today. I'm starting to do patchwork and would like to join your blog. I'm from Brazil, see my handiwork. What a fun thing to do...what a blessing you are!!! xoxo HUgs. What a wonderful outreach. I know how blessed you must have been with the outcome. 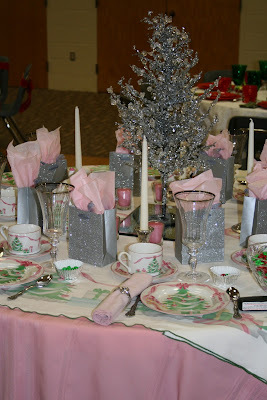 I've participated in different events at our church where we have hosted and decorated tables. Such fun to see all th tablescapes. 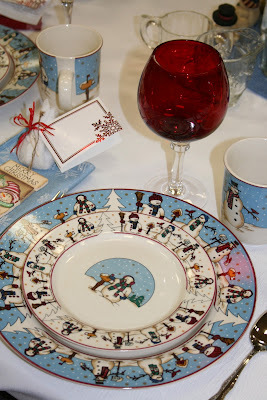 I just knew you would love those pink Christmas dishes. I'm sure the day was a blessing to many. Precious Renee, how I love your heart, our dear Lord thrills over how generous you are with your giftings and your time to reach precious souls who have yet to meet Him whom our souls love. Thank you for the pictures and sharing about the awesome evening. PTL for the new lives in Christ. What a beautiful and meaningful time. The tables were all so pretty. I've enjoyed catching up on your blog and seeing your home decorated for Christmas. What a precious time and opportunity to not only be part of such a special event but, more importantly, reach out and witness. The icing on the cake (sorry for the pun) is the choice that these women made!!! I love this idea for outreach to women of the community! I'm saving this one to see if I can use it in some way next year. My husband is a pastor, so I'm always looking for new ideas to reach out to women. That looks like a wonderful event. Beautiful table settings. The ladies did a great job. That's great some of the ladies changed their lives at the event. 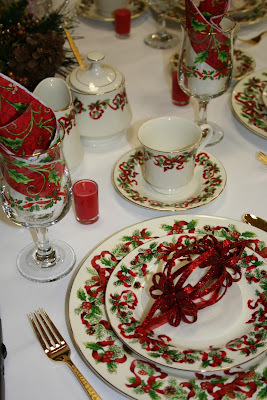 It's all sooo pretty, I just love the tablescapes! And what a wonderful thing you ladies are doing :) Merry Christmas, only 10 days left!! What a great idea. I loved seeing some of the tabletops. What a great community outreach!